Fitment:1992-'99 HD® big twin.Features & Benefits:Universial cover. Machined with an oil pressure relief bleed off valve to maintain consistent oil pressure from the time the engine is started to the time it's shut off. Oil pressure regulation bypass route allows excess oil not used by the engine to return directly to the supply side of the pump, reducing foaming and cavitation. No thicker than a stock pump. Equipped with a stock length oil pump drive shaft. 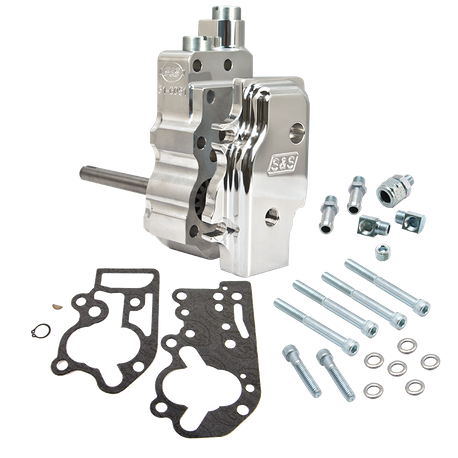 Includes: Complete oil pump assembly, Oil pump driveshaft, Miscellaneous hose fittings, plugs and Paper gaskets with Mounting hardware. Gears and shims not included. Note: Chrome Plating the Pump & It is extremely difficult to chrome plate an oil pump without getting chrome in the passageways, cavities or on the machined surfaces where the gears, check ball, and pressure valve operates. Chrome in these areas as well as on the gasket surfaces impairs the pumps performance by altering the operating tolerances machined into the parts. In addition, abrasive particles of chrome may break loose causing damage to the pump and the engine. Because of this, S&S® does not recommend chrome plating the pump body or cover. S&S® voids its warranty if these parts are chrome plated. *Pinion shaft gears included in these kits fit stock 1984-’89 pinion shafts and S&S pinion shafts for 1984-’99. Will not fit stock 1990-’99 straight pinion shafts. Standard style covers have feed and return holes in the stock locations. The universal cover has a number of oil feed and return options, allowing maximum flexibility for customized applications. Chrome Plating the Pump – It is extremely difficult to chrome plate an oil pump without getting chrome in the passageways, cavities or on the machined surfaces where the gears, check ball, and pressure valve operates. Chrome in these areas as well as on the gasket surfaces impairs the pumps performance by altering the operating tolerances machined into the parts. In addition, abrasive particles of chrome may break loose causing damage to the pump and the engine. Because of this, S&S does not recommend chrome plating the pump body or cover. S&S voids its warranty if these parts are chrome plated.